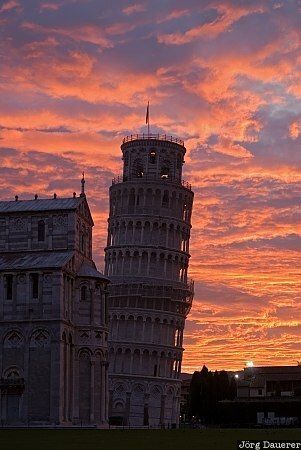 A spectacular sunrise behind the leaning Tower of Pisa. Pisa is in the northern part of Tuscany in central Italy. This photo was taken in the morning of a sunny day in October of 2009. This photo is part of the exhibition Towers (February 2011). This photo was taken with a digital camera.